Detailed review of CareQuest Nutritions Carebiotics. See how this probiotic supplement compares against all the others! Overall, at 2 out of 5 stars, CareQuest Nutritions Carebiotics is a slightly below average product. There honestly just isn’t much I like about this probiotic. The few positives I can pick out are the capsules are vegetarian and they use some solid probiotic strains. Most importantly, I just didn’t feel anything while taking this probiotic. I felt no improvement whatsoever, which was a complete bummer. You also have to keep the bottle refrigerated at all times to maintain potency. This is such a hassle and makes me scared that I just got a bunch of dead cells. This product also just goes way overboard. It contains 40 billion cells and 14 probiotic strains, which is incredibly potent even for a specific ailment. When you have this many cells and strains it can lead to really bad side effects and even cancels out the good bacteria. This probiotic isn’t safe for kids and it’s incredibly expensive. $40 only lasts you 1 month! The directions say to take 1 capsule daily before a meal and unfortunately the capsules seem big and chunky. Last but certainly not least, the bottle does not list ANY potential allergens. This is a huge red flag for me. On the website it did list the probiotic is gluten free and lactose free. This is wonderful, however it really needs to be listed on the bottle. Also, it doesn’t list anything else so if you’re really allergic to anything, steer clear of this probiotic. Overall, at 2 out of 5 stars, CareQuest Nutritions Carebiotics is a below average product because it’s expensive, uses too many cells and strains, needs to be refrigerated and isn’t safe for kids. 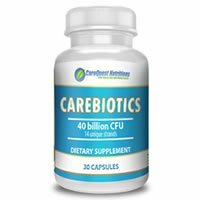 CareQuest Nutritions Carebiotics has 40 billion CFU in 14 unique probiotic strains. Lactobacillus acidophilus may also help with gas, bloating, constipation, diarrhea and vaginal infections. Carebiotics doesn’t list if there are or aren’t any allergy concerns on the bottle. This really bothers me since so many people battle with food intolerances and allergies. On their website, it does state that the capsules are lactose free and gluten free. That’s great, however I really wish they ‘d listed that on the bottle. As for any other allergens, I just can’t say since they give us nothing to go off of. If you’re allergic to anything else besides lactose or gluten, please steer clear of this probiotic. The other ingredients include: maltodextrin and cellulose. For 30 capsules, lasting 1 month, it costs $39.99. This works out to be $1.33 per day to take this probiotic. That’s definitely way above average and very expensive. I don’t think this probiotic is a good value for the price. I surprisingly didn’t experience any side effects while taking Carebiotics. I was pretty shocked by this because the product is very potent. I would definitely say this is not the norm for taking this probiotic. With 40 billion CFU in 14 different probiotic strains, this probiotic goes way overboard. When so many cells and strains are used, it can often times lead to uncomfortable side effects such as gas, bloating and stomach pain. CareQuest states on their website that if you’re not happy with the product for any reason, you can get your money back. They say to call their customer service department and a representative will walk you through how to ship the product back. The company will issue your money back once they get the product back. To buy CareQuest Nutritions Carebiotics, click here. Side Effects None for me but be careful for potential side effects – it’s potent!